Discussion in 'General (Main)' started by BadMotoWeazal, Oct 3, 2011. I'm VERY seriously considering going the LHRB route when I have EFM make me a clutch later this year. Will be weird not having a brake pedal, I think, but am sure it is a quick adaptation. When I get a Rekluse for my bike (just gathering the $) I fully intend on converting the clutch into a LHRB. At this point my plan is to get a cable made up that will run from the clutch master cylinder on the handlebars to the rear brake master cylinder, then getting one of those banjo bolts with 2 sets of holes in it (see below) so I can retain the foot brake as well. Has anyone else done this before? To me, having the LHRB will take me back to my BMX/MTB days, so I don't think it'll take long to get used to it. Reckon it'll rock! I first put one on my WR250 and really liked how much easier and better the braking was on steep downhills. Hills that used to make me nervous because of limited places to apply the rear brake don't seem so steep anymore and actually fun. So the next thing was to put one on the TE450. I machined my stock master cylinders so I can plumb them up for dual control (pedal and lever), but never put them back on because the handle bar control works so well. On the 450, I made a bracket to hold the stock clutch master cylinder for some manual control over the Rekluse. The Rekluse works so well that I have only used it to help finding nuetral. When you say "a cable between the master cylinders, I guess you mean hose? I have heard of guys using their clutch master cylinders for brakes. They may work for awhile, but the rubber is different and I'm told in time brake fluid will break down the rubber parts intended for mineral oil. I don't think pressurizing the outlet of the rear cylinder will pressurize the caliper, because the fluid will end up going through the bleed back ports and to the reservoir. The only way I know of to do it is to plumb into the reservoir or reservoir port, depending on your cylinder, then the fluid will go through the bleed back ports in the cylinder and piston and to the caliper. Plumbed this way the reservoir on the handle bar will also be the foot pedal reservoir. This is how the Rekluse kits work. Rekluse makes the kits for the later foot master cylinders that don't use a remote reservoir. The master cylinders are the early type (external reservoirs), which required me to machine them for threads in the reservoir ports for fittings. Danny at Rekluse was very helpful to me when I was trying to figure out the best way to get set up with LHRBs. 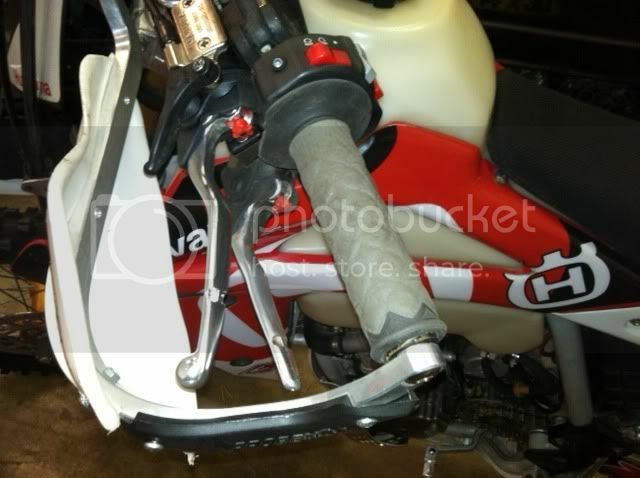 I am particularly interested in fitting a LHRB to my '05 TE250 and also keep the foot brake functional. If anyone has done this successfully I would appreciate your input. I already have a spare clutch perch and was considering machining it to fit a return line in place of the original foot brake reservoir, but not sure if it will be big enough to hold sufficient volume of oil. Then fitting a hydraulic "Check" valve in the system, so that the higher of the two signals (Hand/Foot) would actuate the brake caliper. For this to function correctly both actuators would need to share a common reservoir.....? Wont you lose engine braking Seahorse. If so, I could not live with it and that is why I do not ride smokers, as light and flickable as they are. Coming down a clay based rough steep incline I am always greatful for the engine braking aspect of a 4 stroke. Engine braking is a bit hit and miss with a Rekluse, particularly in situations you mention. Changing down through the gears helps keep the revs up and the clutch engaged. However if you lock up the rear wheel the clutch automatically disengages, thus losing engine braking. Blipping the throttle engages the clutch again. This is one of the few shortfalls of a Rekluse, certainly made up for by it's many advantages. Yeah, I am aware of this. There are 2 options to deal with this. The first is to get the master cylinder rebuild kit that can handle the brake fluid, or sure DOT5.1 synthetic brake oil. Interesting. So my cheat idea won't work Ahh well. LOL.... If you ain't cheating, then you ain't trying. But Sunday, I was in a wide open space. Hand control & rear brake feel is much better than with a boot covered foot, my balance was better as I kept weight on the pegs instead of the foot brake pedal & right hand turns you can trail brake all the way through if need be. So far no regrets & of course I was able to ride friends bike with this setup before purchasing which helped with my decision. I know 5 other guys that have been running the system for well over 3 years with good results. Unless you can do the work yourself or have a machinist buddy, a later cylinder with integeral reservoir migh be a better option. There iwill be shop time for setup, boring the hole for 17mm threads (the smallest cleanup size), cutting the threads then making a fitting to bush the hole down to 10mm for the brake banjo fitting. Finding a later cylinder off a KTM or Husky on Ebay shouldn't be that hard. Rekluse makes a sleeve that fits in the fill port on the later (08 up I think) cylinders that allows you to plumb into it with a standard banjo fitting. I don't know how installing a check valve will achieve what you want it to. Depending on where you put it, it seems to me, it will either not allow the brake to apply because the pressure fluid will go to to the other cylinders reservoir or not release if it does. And yes, the dual control (lever and pedal) systems use the handlebar cylinder for both reservoirs and there is sufficient volume. I have not put mine together on the bike to have first hand knowledge, but this is how Rekluse sets them up. When I put mine on, I thought I'd want dual control, but found the lever control to work great by itself. Since I have most of the work done, I will go ahead and finish the dual setup to see if I'll use it. Once you get used to the left hand rear brake, the foot pedal is only used when you stop on a slope and want your hands free. The lack of feel through the foot pedal as compared to the hand operated lever makes using it a quicky forgotten skill. Whenever you jump on a normal bike your first reaction is how the hell do you control the rear wheel braking......I want my bike back. I would not worry about that, I've been running brake fluid (DOT4) in my Magura master on my '05 TE for close to 5 years and my '09 TE for 2 years without any kind of rebuild. I do recommend taking them apart and cleaning well with brake cleaner. As a stunter I use a rear hand brake all the time for wheelies while standing on the seat. The only tru way to have a powerful rear hand brake it to ad a second caliper to the rear bracket so you have two rear calipers. When running the banjo bolt or "splitter" style when you use the hand brake it pushes up the foot pedal. so you cant use both at the same time to transition form one to the other. I add a kawi 636 rear caliper to mine with a 13 mm magura master. tons of power and great feel. there are pics on my blog.freestylesupermoto.com mightbe a few pages in. it took a long time of trial and error on a lot of bikes to find the perfect combination but now I got it dialed in. Your demands far exceed mine. I like the 9.0 mm magura as rear brake operation is one finger and lock up is easily achieved with minimal effort when you want it. I have heard some worries about adding to arm pump but I still suffer arm pump in my right arm far more and worse than my left. Arm pump has become a distant memory for me since Flexbars. I actually forgot about it till you mentioned it.